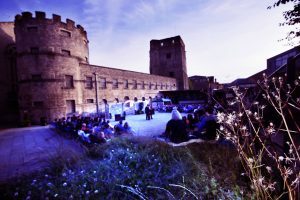 To mark BMH’s upcoming production of Twelfth Night and The Tempest at Oxford Castle Unlocked, we met with cast member Justine Malone to find out more. Read on to find out all about her preparations for the play plus her most memorable onstage mishap! What characters do you play? How do you go about developing your character? In Twelfth Night I’m playing Orsino’s right hand woman, Valentine, and The Tempest I’m playing Miranda. Character development starts with the directors, both of whom had very clear ideas about what they wanted but allowed me to develop it alongside them incorporating my own ideas along the way. Valentine is straight-laced, does her job well, and is somewhat repressed. She is not in love with Orsino but finds the arrival of Cesario undercuts her professional value to him. I’ve been influenced by people I have met in real life – mainly in the corporate workplace – when developing her demeanor and delivery. Miranda is the complete opposite – feral, innocent, an old romantic. She isn’t afraid to stand up for what’s right. She loves her mother in that traumatic ‘god I hate you’ kind of teenage way. To develop her I adopted a mindset of constant wonder with the small things – every new item, person, and place is magical. A big influence for this was Disney characters – Mowgli and The Little Mermaid. What’s your favourite part of being on stage? One of my big flaws in rehearsal is always looking for the laughs, even in serious moments. I get a big thrill from hearing the crowd crack up at something I’ve said or done. How much theatre have you done in the past? Any particular highlights? Growing up, I did youth theatre and A Level drama – a big highlight of which was playing Bertha in Polly Teale’s Jane Eyre at college. No idea why I have been cast again as a feral mad woman in this show… a pattern is emerging. Aside from that, my academic background is in theatre and Shakespeare. Some of my practical experience is in comedy, which I studied for a few months at The Soho Theatre. I also wrote and performed a play with the Young Friends of the Almeida. 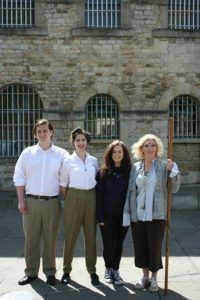 In Oxford, I was in last year’s BMH show playing Lady MacDuff and Hermia, and for Oxford Theatre Guild I have played Miss Grey in Sense & Sensibility, assistant directed King Lear, and co-directed Festen. I’m also dramaturg for the TranShakespeare project with King’s College London and The Young Vic. Do you have any backstage traditions before you go on? I slap myself around the face repeatedly for a good 15 minutes. Then I passionately kiss the nearest person – doesn’t matter who – and walk on. In Jane Eyre I had to spit cold chicken soup in the face of a maid and on the first night got her right in the eye. I maintain it was an accident.